“An apple a day keeps the doctor away” but not Santa Claus, so don’t worry about scaring him off. Just because he favors cookies over kale doesn’t mean you have to follow his example. The natural sugars in fruit like apples and berries will satisfy your seasonal sweet-tooth without compromising the healthy habits you’re trying to maintain. 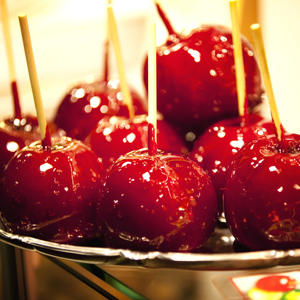 As for those delicious candied apples — you won’t get any coal in your stocking for it, but use your judgment when it comes to adding on the extra sugar. 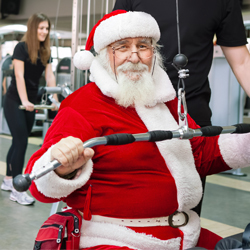 Turn the hustle of holiday shopping into a workout by going the extra mile. Annoyed by the lack of mall parking? Strategically park further away so you can walk the added distance and burn off some extra calories. Overcrowded escalator? Take the stairs! Too many shopping bags to lug around? Looks like “arm day” came early this year! And finally, always take the long way around the mall to simultaneously avoid the food court and log a few extra steps. So remember to push it to the limit while holiday shopping, just not with your credit card! This year, be healthier by challenging yourself to include a variety of colored fruits and veggies in your holiday feast. If your family is anything like mine, your Thanksgiving dinner usually looks like a delicious pile of potatoes and other beige-colored carbs. And while sweet potatoes are healthier than traditional spuds, trying adding a little more color to your next holiday dinner with some crisp green beans, roasted carrots, fresh tomatoes, and sauteed spinach. Get creative and try to find something to eat for every color of the rainbow (bonus points if you get something blue!). After your holiday feast is over and before the desserts and drinks start to flow, take a quick break to give your body a chance to recover. In fact, rather than succumbing to the inevitable food coma right away, go for a quick family hike around the neighborhood to bask in all the holiday lights and decorations. By the time you get back home you’ll be ready to sit by the fire and sip on a hot drink (eggnog anyone?) without feeling guilty for overindulging.